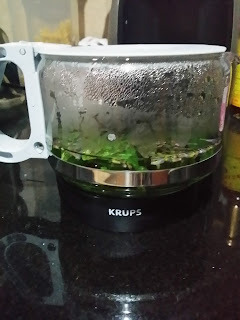 I used to make pots of mint & honey tea with fresh mint leaves. I enjoyed sipping the menthol taste infused in the drink. Was trying out mint with lavender tea one day. 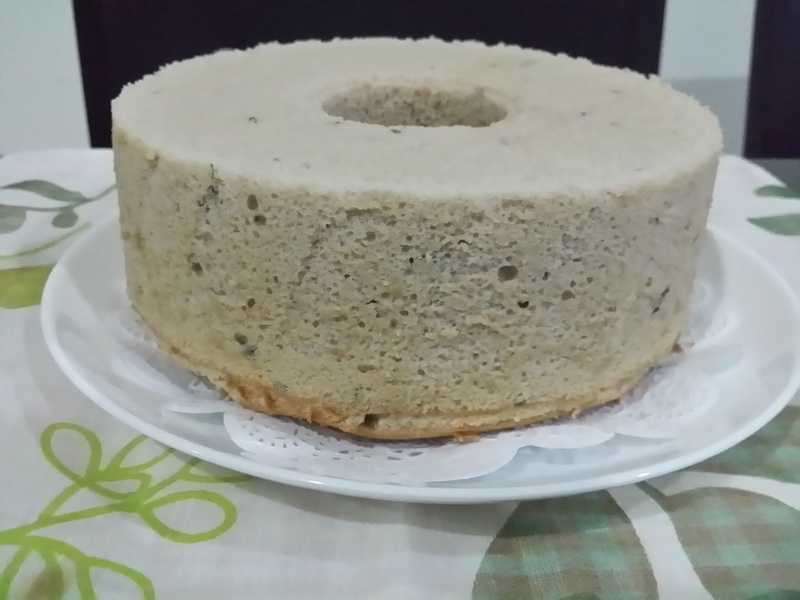 Having baked 2 chiffon cakes using tea : Rose Tea Chiffon cake & Rose Tea Hokkaido Chiffon Cupcakes, I was game enough to try out using mint and lavender tea to make this fluffy soft tea flavour chiffon cake. I've added 2 drops of violet food colouring, thought of making a pale shade of lavender colour. Haiz ! But it turned out pale brownish instead. Oh ! I should have omitted it ... 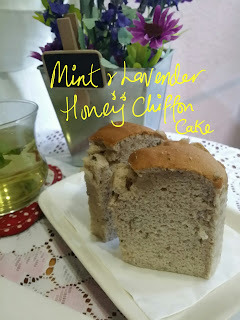 Anyway, I liked the hint of cool sensation minty effect especially when chilled (yes, I kept some in the fridge for our next day's brekkie), a hint of icy mint cooling and the aroma of the lavender. Truly enjoyed! 1) Sift the flour and set aside. Preheat the oven to 180°C. 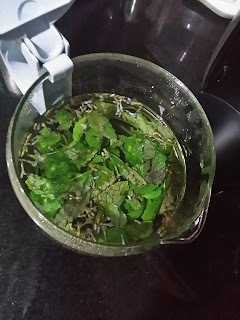 Pour about 100ml of hot boiling water over the mint leaves and lavender in a teapot and allow to steep for about 15 minutes. Stir and mix the honey before straining 60ml of tea into a cup, set aside to cool. Let it steep for 15 minutes to bring out the mint & lavender fragrant. 3) Separate the eggs into yolks and whites. 4) In a clean mixing bowl, whisk the cold egg whites and cream of tartar till foamy using the electric mixer. Gradually add in caster sugar in 3 separate additions and beat till stiff peak, formed into a firm meringue. Transfer to a big bowl and chill in the fridge. 5) In the same mixing bowl, cream together egg yolks and caster sugar until pale and thick using the electric mixer (about 3 - 4 minutes). Add vegetable oil and continue beating. Next stir in the chopped mint and the mint & lavender honey tea. 6) Fold in the sifted top flour with a spatula and mix until just combined. Next stir in the dried lavender and 2 drops of violet food colouring and mix well. mixture in 2 batches until it looks evenly mixed (no streaks of meringue). 8) Pour batter evenly into the ungreased chiffon pan and gently give the pan a bang on the table top to release air bubbles. 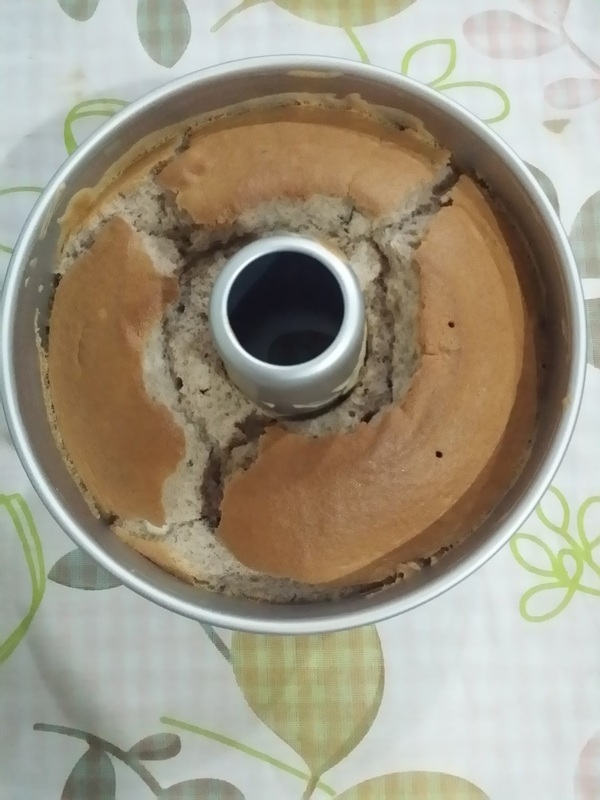 9) Bake chiffon cake at 180°C oven for 20 minutes, lower the temperature to 160°C and continue to bake another 15 minutes until the cake surface turns golden brown, and a skewer inserted into the centre comes out clean. *note : I used the lowest rack. 11) Immediately invert the pan to cool before unmoulding the cake from pan. Happy baking & enjoy your weekend! 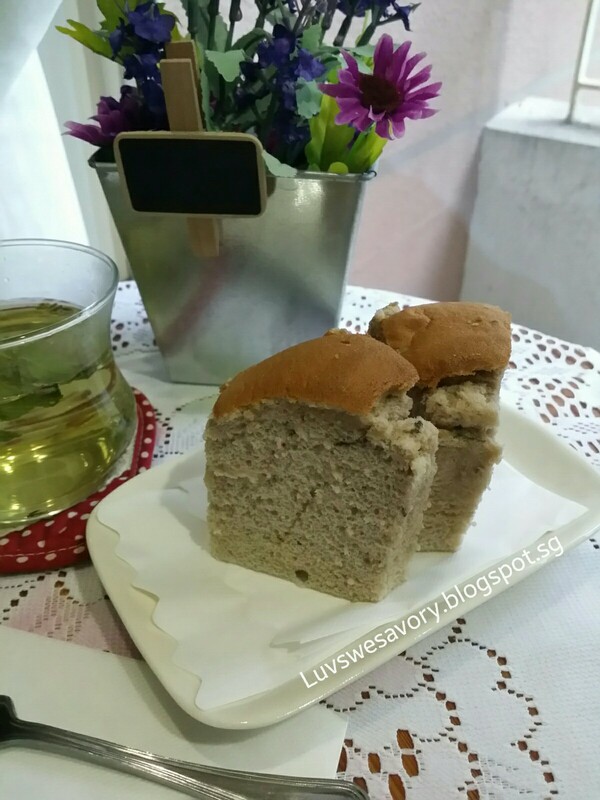 Submitting this post to the event Little Thumbs Up (July 2015 Event: Tea) organised by Zoe of Bake for Happy Kids and Doreen of My Little Favourite DIY and hosted by Cheryl of Baking Taitai. Hi Karen, I bet this cake tasted wonderful, how creative to infuse the mint and lavendar together. 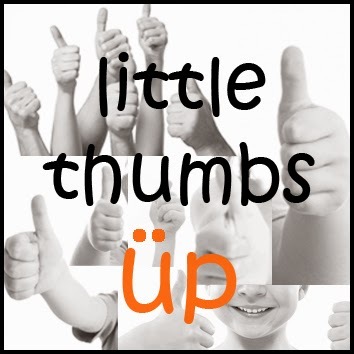 Hi Karen, this looks like a good start for Little Thumbs Up event! I hope I could bake something this weekend too! Good morning Karen, I would love 2 piece of chilled cake for breakfast please! Hi Karen! Unfortunately, I am not very fond of mint taste in cakes or chocolate. I only like it in kerabu hah..hah... But still, your chiffon cake turned out nice and light even though it was not the color you wanted.